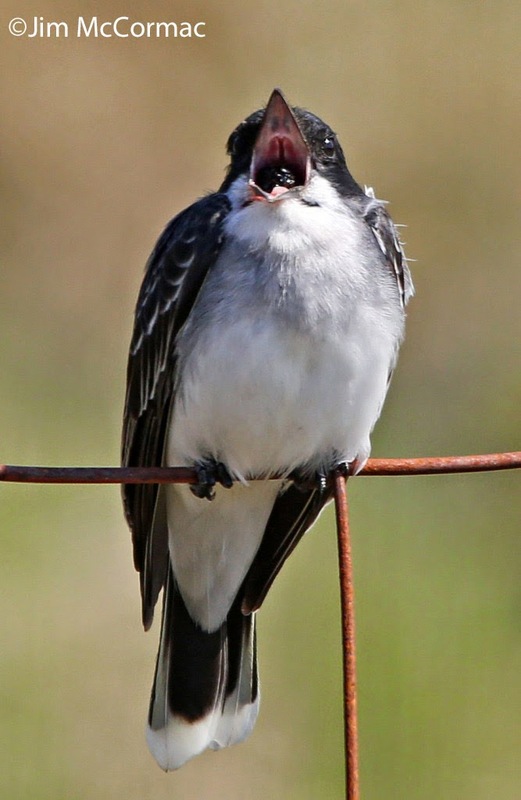 An Eastern Kingbird sits on his fence, exuding a regal and stately air befitting its name. 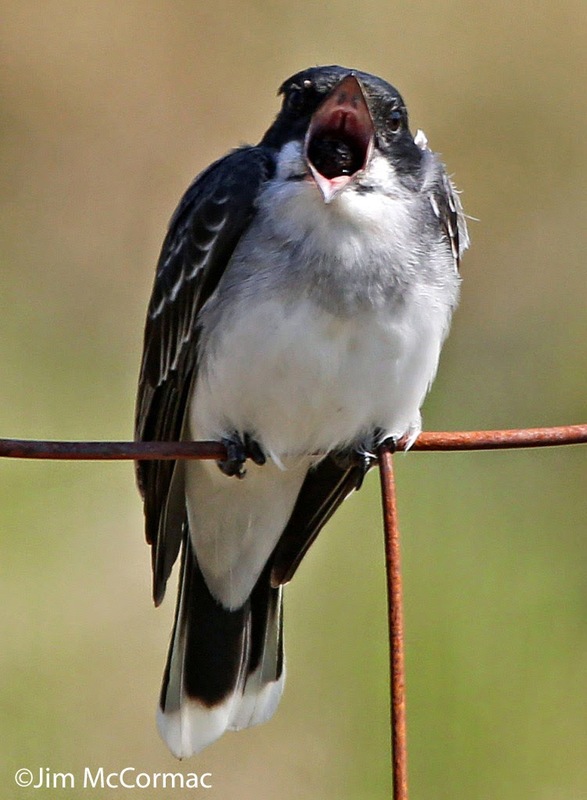 I photographed this flycatcher up in Presque Isle County, Michigan, one of numerous kingbirds that I saw there. 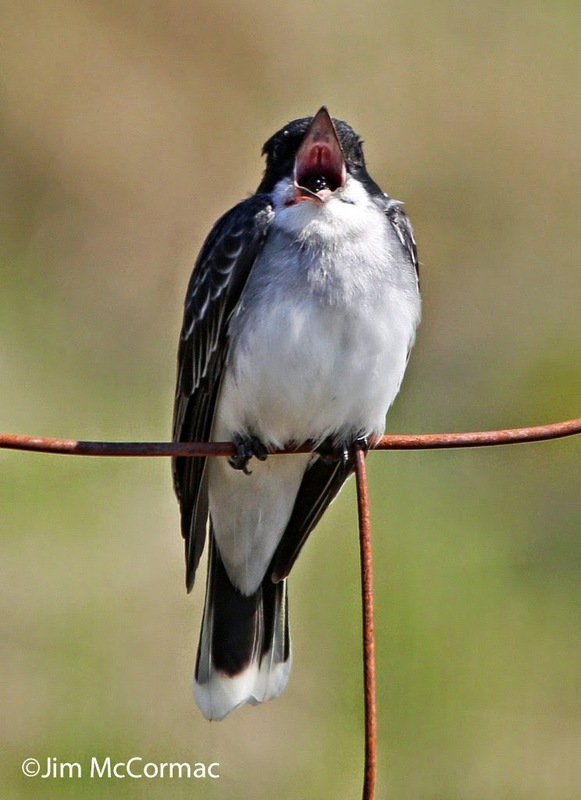 The scientific name is Tyrannus tyrannus, and tyrants they are. 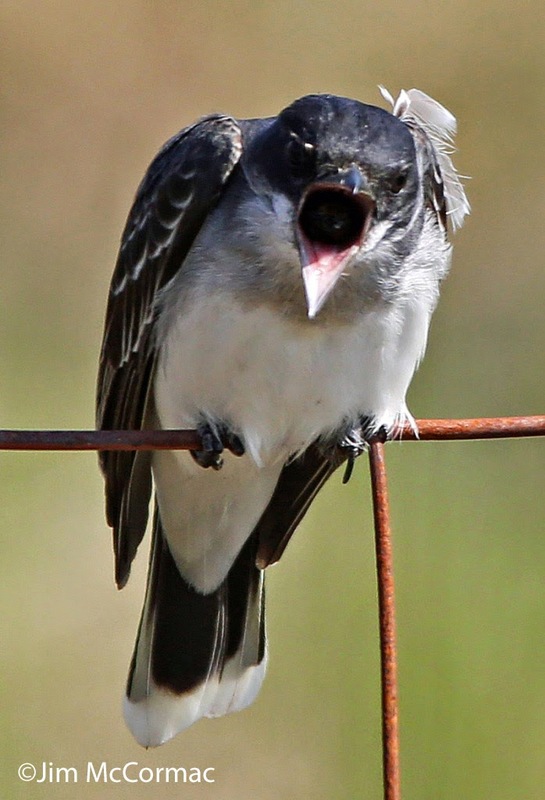 Kingbirds don't seem afraid of much, and have no qualms about scrambling skyward to harass intruding raptors, crows, or ravens. This bird paid me no mind, and using my car as a blind I set out to make some images of the handsome tyrannid when I saw it was about to engage in something rather cool. As I clicked away, the kingbird suddenly began to upchuck a pellet! Luckily I had the camera on burst mode, which is the equivalent of a photographic machine gun. By holding down the shutter button, I could burst off about six shots a second and thus capture the following series of images. Owls are probably the best known group of birds when it comes to casting pellets. Indeed, experienced birders often find roosting owls by the presence of pellets. 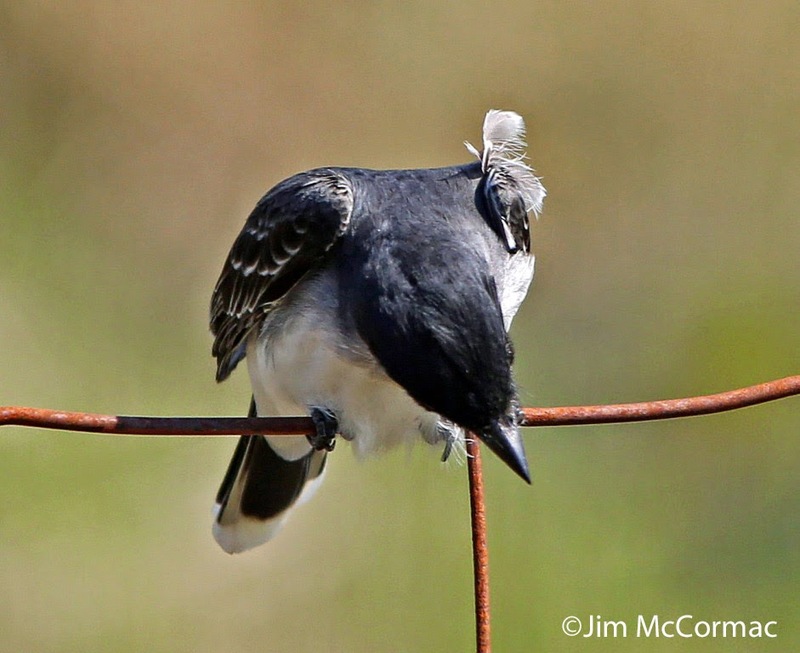 A pellet, as applied to birds, is just a condensed mass of indigestible bits from its prey. In the case of owls, a pellet would be mostly bone and fur. Rather than expel the stuff through the posterior end, birds cast the pellets back out through the mouth. But owls are by no means the only group of birds that form and expel pellets. Probably most species that make a habit of eating animals that are partially comprised of hard dry matter such as bones and fur form and cast pellets. 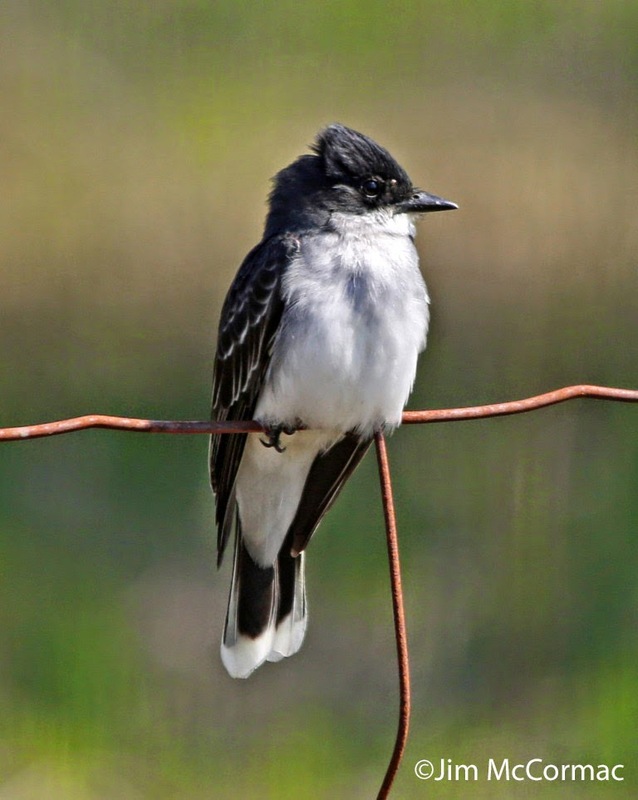 In the case of the kingbird, its pellets are primarily chitin - the hard indigestible parts of insect exoskeletons. A fraction of a second after I made this shot, the bird gagged out the pellet. The elapsed time for this entire sequence of photos was only a second or so. It was just fortunate that I already had the camera trained on the bird. There would not have been enough time from noticing the imminent casting of the pellet and getting the camera up and in position to fire off the shots. With a final quick gagging flourish of the head, the pellet was cast out and the bird resumed its normal posture. I may be easily amused, but it was quite interesting to witness and I'm glad that I was able to photo-document the event, crude as my photos may be. I have only one regret, that I didn't think to go over to where the bird was perched and try to find the pellet. It likely would have been largely made up of dragonfly parts and beetle shells. Well, maybe next time. I think these are great shots of an event I have never thought about happening. I guess if I thought about it I would think they might do this. I thought that perhaps their gizzard would grind up any hard parts. Those beetle wings would be difficult to digest tho. This is quite fascinating! I'm glad you caught the action! do all birds that eat hard shelled insects do this?